Yunzi Go stones are manufactured in chinese province Yunnan. The exact composition and technology of its production, elaborated in the Ming Dynasty, are kept strict secret. It is said that there are more than 40 ingredients which enter into the composition of Yunzi, including agate and amber. 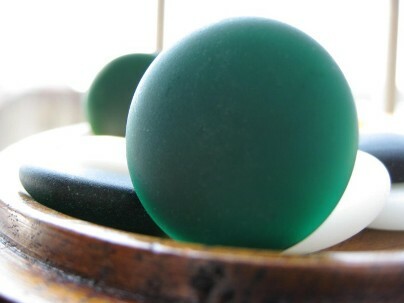 Yunzi stones can be devided with regard to their shape, or color of white stones. There are two types of Yunzi. Classic- flat on one side, convex on the other, or Modern- convex on both sides. Classic, flat shape of Yunzi is caused by manual casting in an open mould. Classic- single convex are much cheaper than modern- double convex, thanks to smaller ammount of used composition and little technological waste. Colour of black Yunzi is always the same. Regardless of shape, black stones watched against the light are always a bit transparent and seem to be green. Intensity of transparency and shade of green can be different in different sets. 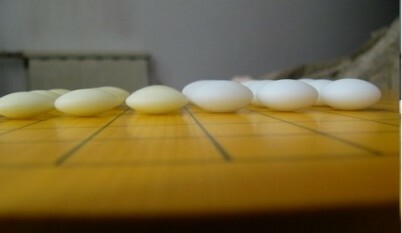 Classic white Yunzi stones produced according to the traditional formula are ivory-coloured. Yellowish stones with different intensity and shade are different in different sets. Watched against the light are transparent. 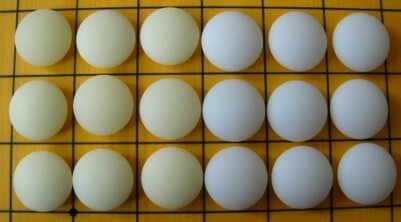 Much cheaper are sets with white stones produced due to a modern, cheaper composition. They are snow-white, transparent. Insignificant meanning have light-green ”white” Yunzi, popularly called „false jade”. Due to the traditional technology there might be an acceptable difference in thickness and diameter of stones in a set. „Black” Yunzi watched against the light. Classic Ivory Yunzi against Snow-white Modern Yunzi. Shape of double convex, classic ivory-coloured againts double convex, modern snow-white.